The wind tends to blow more strongly at night when demand for the electricity wind turbine generators can make is at its lowest. Therefore, finding ways to store energy so that it can be used at times of high demand is essential. The Pacific Northwest National Laboratory has been studying how compressed air could be the solution to this energy storage problem. 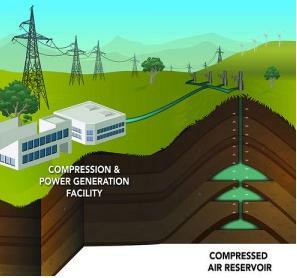 When electricity generation exceeds demand, a large air compressor (powered by the generated electricity) forces air underground into natural porous rock reservoirs. When demand increases, this high pressure air is release back up the surface where it is heated and turns turbines to generate electricity. The overall cycle is up to 80% efficient. The research looked into suitable locations for this type of compressed air energy storage – not easy since the location must be near to high voltage power lines, have very specific geology, and be near to either natural gas lines or a geothermal heat source for heating the compressed air. One of the locations they studied had an air reservoir large enough that the energy stored could be used to generate electricity for 40 days – perfect for storing the surplus hydro electricity generated in the spring for example.